Formation of an HIV-1 particle with a conical core structure is a prerequisite for the subsequent infectivity of the virus particle. We have previously described that glycineamide (G-NH2) when added to the culture medium of infected cells induces non-infectious HIV-1 particles with aberrant core structures. Here we demonstrate that it is not G-NH2 itself but a metabolite thereof that displays antiviral activity. We show that conversion of G-NH2 to its antiviral metabolite is catalyzed by an enzyme present in bovine and porcine but surprisingly not in human serum. Structure determination by NMR suggested that the active G-NH2 metabolite was α-hydroxy-glycineamide (α-HGA). Chemically synthesized α-HGA inhibited HIV-1 replication to the same degree as G-NH2, unlike a number of other synthesized analogues of G-NH2 which had no effect on HIV-1 replication. 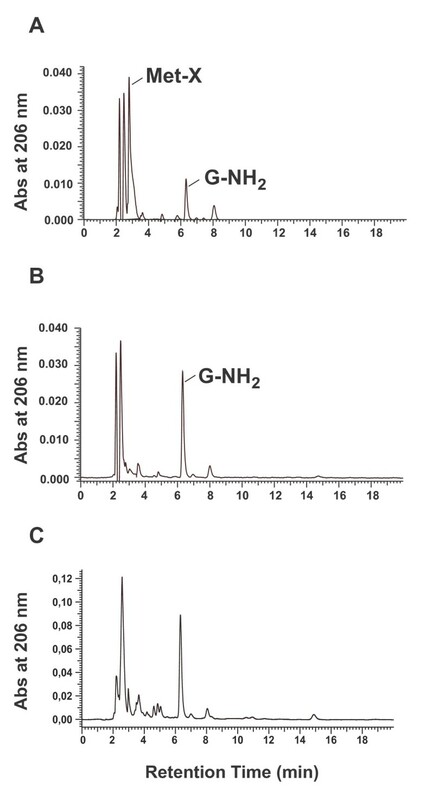 Comparisons by capillary electrophoresis and HPLC of the metabolite with the chemically synthesized α-HGA further confirmed that the antiviral G-NH2-metabolite indeed was α-HGA. α-HGA has an unusually simple structure and a novel mechanism of antiviral action. Thus, α-HGA could be a lead for new antiviral substances belonging to a new class of anti-HIV drugs, i.e. capsid assembly inhibitors. During or concomitant with the HIV-1 release from infected cells, the Gag precursor protein (p55) is cleaved sequentially into matrix (MA/p17), capsid (CA/p24), nucleocapsid (NC/p7) and p6. Thus, proteolytic cleavage of p55 within the budded particle triggers a morphological change of the core which transforms it from a spherical  to a conical core structure consisting of approximately 1,500 p24 molecules [2–4]. The conical core formation not only results as a consequence of the proteolytic cleavage of p55 but also from substantial conformational changes and rearrangements of the p24  which is connected to one another through N-terminal hexamer and C-terminal dimer formations [5–8]. Acquisition of virion infectivity, reverse transcription, and subsequent dissociation of the capsid core are all critically dependent on just the right semi-stability of the capsid cone structure, which in turn is made up of multiple semi-stable non-covalent p24-p24 interactions . Thus, proper structural rearrangement of p24 after Gag cleavage is a crucial step and is a highly conserved feature in most retroviruses . This makes p24 of interest as a target for developing new antiviral drugs. There are twenty-five approved drugs that belong to six different antiretroviral classes for the treatment of HIV-patients . The majority of these drugs control HIV-1 infection by targeting the two viral enzymes reverse transcriptase and protease . A 36 amino acid peptide binding to the transmembrane glycoprotein gp41 inhibiting the fusion of the viral envelope with the plasma membrane is also used [13, 14]. Two other classes of antiretroviral drugs, a CCR5 co-receptor antagonist entry inhibitor  and an integrase inhibitor [16, 17], have also recently been approved. Other drugs being developed include zinc finger inhibitors affecting the RNA binding of the nucleocapsid protein (NC, p7) [18, 19], and capsid maturation inhibitors [20–22]. We have previously shown that the tripeptide glycyl-prolyl-glycineamide (GPG-NH2) cleaved to G-NH2 by dipeptidyl peptidase CD26, present in both human and fetal calf serum, affects proper HIV-1 capsid assembly and infectivity [23–26]. Here we show that G-NH2 by itself does not affect HIV-1 replication, but displays antiviral effect only when converted to a metabolite by a yet uncharacterized enzyme present in porcine or bovine serum but not in human serum. The metabolite was identified as the small molecule α-hydroxy-glycineamide (α-HGA) having a molecular mass of only 90 Daltons, a molecule which we recently showed could inhibit HIV-1 replication . The antiviral activity of G-NH2 was tested in HIV-1 infected H9 cells cultured in medium containing human (HS), porcine (PS) or fetal calf serum (FCS). When FCS was used, 100 μM G-NH2 repeatedly abolished HIV infectivity (Fig. 1A, FCS). Similar results were also obtained when infected cells were cultured in PS (data not shown). However, no antiviral activity was observed when the infected cells were cultured in HS (Fig. 1A, HS). An explanation for this could be that G-NH2 had to be converted by an enzyme present in FCS and PS, but not in HS, to acquire its antiviral activity. To test this hypothesis, 1 mM G-NH2 was dialyzed against FCS (pre-dialyzed against PBS five times to clear it from low molecular weight material) at 37°C over night. 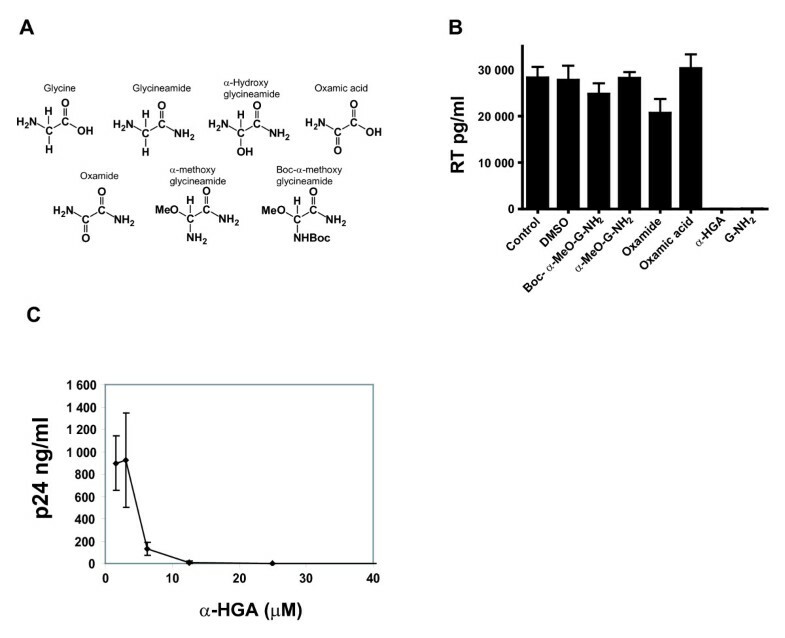 The dialysis solution (DS) obtained which contained the presumed G-NH2 metabolite, was then added to infected H9 cells cultured in medium containing HS (Fig. 1B, DS). Infected cell cultures to which 100 μM G-NH2 or no drug had been added served as controls. The results of a typical experiment are shown in Fig. 1B. G-NH2 showed no antiviral activity, however, infected cells cultured in human serum with DS at a 1/10 dilution, corresponding to ~100 μM of possible G-NH2-FCS product, showed virus replication that was completely inhibited (Fig. 1B, DS). Antiviral activity of G-NH 2 and characterization of G-NH 2 metabolite obtained after dialysis against FCS or PS. (A) H9 cells (105) were infected with the SF-2 strain of HIV-1 and cultured in medium containing 100 μM G-NH2 and either 10% fetal calf serum (FCS) or human serum (HS). Ten days post-infection, the level of p24-antigen in the culture supernatants was assayed with a p24-ELISA. (B) H9 cells infected with the SF-2 strain of HIV-1 were cultured in medium containing 10% human serum (HS) and either 100 μM G-NH2 or a dialysis solution (DS) of 1/10 dilution of 1 mM G-NH2 dialyzed against FCS. Untreated cultures without any addition of G-NH2 or DS served as controls. (C) Infected H9 cells were cultured in the presence of 10% boiled porcine serum (BPS) or non-boiled porcine serum (PS). The infected cultures were cultured with the addition of 100 μM G-NH2, DS or were left untreated. Virus production was assessed using an RT assay. Error bars indicate standard deviations from quadruple cultures. To further test if G-NH2 was converted to the active antiviral substance by an enzyme present in porcine or calf serum, HIV-1-infected H9 cells were cultured in medium containing normal PS or boiled PS (BPS). The cells were then treated with 100 μM G-NH2, with the DS at a 1/10 dilution or were left untreated. A typical experiment is depicted in Fig. 1C. Infected cells without any test compound and cultured in medium containing PS or BPS served as controls (Fig. 1C, Untreated). In contrast to what was observed in cells cultured with BPS and treated with DS, G-NH2 showed no antiviral activity in cells cultured with medium containing BPS (Fig. 1C). DS, however, repeatedly inhibited HIV replication regardless of the infected cells being cultured in the presence of PS or BPS (Fig. 1C, DS). DS derived from 1 mM G-NH2 dialyzed against pre-washed HS or PS was analyzed by HPLC using a cationic ion-exchange column. With G-NH2 dialyzed against PS at 37°C (Fig. 2A) but not at 4°C (Fig. 2B), a peak designated Met-X (retention time at 2.9 min) was always observed in addition to the G-NH2 peak (at 6.2 min). Dialysis of G-NH2 in HS gave no such change in the HPLC pattern (Fig. 2C). The unknown peak fraction obtained by dialysis of G-NH2 at 37°C was also isolated and tested for its antiviral activity (see below). HPLC analysis of G-NH 2 and the G-NH 2 -derived metabolite Met-X. HPLC chromatograms of dialysis solution (DS) after dialyzing 1 mM G-NH2 against porcine serum (PS) at 37°C (A) and at 4°C (B) or human serum at 37°C. The dialysis solutions were analyzed with a cationic ion-exchange column (Theoquest Hypersil SCX, Thermo), and the absorbance was measured at 206 nm. Furthermore, we tested a number of different animal sera for their ability to convert 14C-G-NH2 to the antiviral metabolite X (Met-X). The conversion of G-NH2 to Met-X was detected by the migration pattern in HPLC. As shown in Figure 3, sera from human, rat, mouse, and bird did not convert G-NH2 but sera from rabbit, monkey, cat, dog, pig, horse and cow were successful in conversion. Conversion of G-NH2 to Met-X in different sera. 14C-labeled G-NH2 was incubated with sera from different species at different time points as indicated in the figure. Conversion to Met-X was analyzed by HPLC. Percent conversion to Met-X for respective sera is depicted. 13C2/15N-labeled glycine (Fig. 4A) was transformed to 13C2/15N-labeled G-NH2 (Fig. 4B) by Fmoc peptide synthesis. In order to produce 13C2/15N-labeled Met-X (Fig. 4C), 13C2/15N-labeled G-NH2 (Fig. 4B) was dialyzed against PS or FCS as described above. The 13C15N-labeled Met-X was then purified by HPLC and the peak fraction containing labeled Met-X was concentrated by lyophilization before being analyzed by NMR. Chemical structure and production of G-NH 2 -derived metabolite after dialysis against porcine serum. The chemical structures of doubly labeled glycine with two 13C- and one 15N-isotopes (A) which was transformed into labeled glycineamide (B). The latter was dialyzed against porcine serum at 37°C, and the 13C2 15N-labeled product (C) here is referred to as Met-X. This compound was purified by HPLC and concentrated before being analyzed with NMR. Based on the NMR analysis (1H NMR, coupled 1H-13C NMR, and 2D 1H-15N HSQC NMR) one of the possible structures of the unknown compound Met-X was determined as α-hydroxy-glycineamide (α-HGA). α-HGA was chemically synthesized and compared to Met-X. The HPLC chromatogram of α-HGA was identical to that of Met-X (Fig. 5A). Furthermore, the antiviral activity of the HPLC peak fraction identified as Met-X and α-HGA were tested in H9 cells infected with the HIV-1 SF-2 virus and in chronically infected ACH-2 cells. Both substances had similar antiviral activity (data not shown). The HPLC peak fractions identified as Met-X and α-HGA were also analyzed by capillary electrophoresis using bare silica capillaries under the same experimental conditions. The analysis of Met-X revealed some impurities which were well separated from the major peak containing Met-X (Fig. 5B). The pure α-HGA sample gave a symmetrical single peak, which had strikingly similar migration times to Met-X. The reproducibility was high (RSD = 1.14%; n = 4). Comparison of the UV spectra of the substances in separate experiments further revealed identical absorbance properties. Furthermore, the structural information gained by proton and carbon NMR analyses resulted in identical chemical shift values (data not shown). Comparison of Met-X with α-HGA. HPLC analysis of synthetically produced α-HGA and Met-X, the latter produced enzymatically after dialyzing 1 mM G-NH2 against PS at 37°C, is depicted in panel A, and capillary electrophoresis analysis of α-HGA and Met-X in panel B. Both α-HGA and Met-X treatment at concentrations corresponding to 10 μM resulted in similarly significant changes in virion core morphology (data not shown). Pleomorphic virus particles with distorted, irregular packing of aberrant core structures, partly devoid of dense core material, were seen. Virions having double core structures and occasionally viral cores bulging off from viral envelope were also observed. α-HGA and some other structurally related compounds (Fig. 6A) at drug concentrations of 100 μM were tested for a possible inhibitory effect on HIV-1 replication in infected H9 cells in the presence of FCS. As shown in Fig. 6B, both α-HGA and G-NH2 abolished HIV-1 replication. By contrast, oxamic acid, oxamide, α-methoxy glycineamide, and Boc-α-methoxy glycineamide did not show any significant effect on HIV-1 replication. The 50% inhibitory concentration (IC50) in HIV-1 SF-2 infected H9 cells ranged from 4 to 6 μM for both α-HGA and Met-X. A typical dose response curve for α-HGA is depicted in Fig. 6C. Biological and antiviral comparison of α-HGA and some structurally related compounds. Chemical structures of glycine, glycineamide (G-NH2), α-HGA, oxamic acid, oxamide, α-methoxy glycineamide and Boc-α-methoxy glycineamide (A). 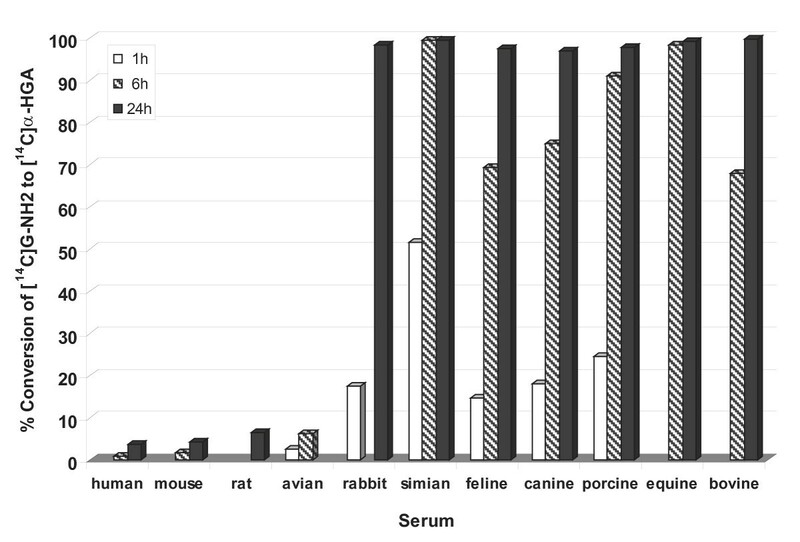 Antiviral activity of 100 μM of respective compound added to HIV-1 SF-2 infected H9 cells cultured in the presence of 10% fetal bovine serum (B). Dose response of the antiviral activity of synthetically produced α-HGA (C). In this study, we were able to identify, isolate and characterize a novel antiretroviral glycineamide (G-NH2)-derived metabolite (Met-X) obtained after incubation of G-NH2 in porcine (PS) or fetal calf (FCS) serum. Dialysis of G-NH2 against FCS at 4°C or boiled PS gave no Met-X, indicating that the enzyme responsible for converting G-NH2 to Met-X is temperature-dependent and heat-sensitive. Furthermore, unlike in FCS or in PS, G-NH2 could not be converted to Met-X when incubated in human serum at 37°C, suggesting that humans lack either the active enzyme or a necessary co-factor. Interestingly, humans seem to share this inability to convert G-NH2 with mice, rats and birds. However, other species such as non-human primates can readily convert G-NH2 to Met-X. Here we characterized Met-X by NMR and this unknown compound was identified as α-hydroxy-glycineamide (α-HGA). In addition, with NMR, HPLC and capillary electrophoresis analysis of Met-X and the synthesized α-hydroxy-glycineamide the same chemical structure was determined. Therefore, it is very likely that these two compounds are identical chemical entities. The antiviral activity of the Met-X purified by cation exchange chromatography and identified as α-HGA by NMR was also confirmed both in H9 cells infected with the HIV-1 SF-2 virus and chronically infected ACH-2 cells. Consistent with previous reports on GPG-NH2 and G-NH2, the addition of Met-X or α-HGA to the culture medium of infected cells resulted in HIV-1 particles with aberrant core morphology. The reduction in infectivity was not due to cytotoxicity, since neither Met-X nor α-HGA at concentrations up to 1,000 μM has any effect on the cell viability of PBMC or a number of other cell lines . Furthermore, α-HGA had no mitogenic activity against human PBMCs at concentrations of up to 2,000 μM. Two other compounds that inhibit or interfere with the HIV-1 capsid (p24/CA) maturation or assembly have previously been reported [20, 21, 28]. PA-457 [20, 22], is a compound that binds to the proteolytic cleavage site of the p24 precursor (p25/CA-SP1) and thereby affects its maturation to p24. α-HGA does not affect the proteolytic processing of p25 . The other compound reported by Tang et al. describes the binding of N-(3-chloro-4-methylphenyl)-N'-2-(5-[dimethylamino-methyl]-2-furyl)-methylsulfanyl-ethyl urea (CAP-1) to the N-terminal domain of p24 . CAP-1 affects HIV-1 capsid cone formation but did not prevent virus release . However, α-HGA, which is comparatively a small molecule, specifically affected HIV-1 CA assembly and cone formation, possibly by binding to the hinge region between the N- and C-terminal domains of p24 . A 12-mer alpha-helical peptide (CAI) was also shown to interfere with p24 dimerization, but not with HIV-1 replication in cell culture due to the lack of cell penetration [28, 29]. However, more recently a structure-based rational design was used to stabilize the alpha-helical structure of CAI and convert it to a cell-penetrating peptide (CPP) displaying antiviral activity . In this study, we have reported that G-NH2 by itself has no anti-viral activity but is converted to a small (molecular mass 90) anti-retroviral compound when incubated in some animal sera. The new compound was identified as α-HGA, which has an unusually simple structure and a novel mechanism of antiviral action. Thus, α-HGA could be a lead for new antiviral substances belonging to a new class of anti-HIV drugs, i.e. capsid assembly/maturation inhibitors. Peripheral blood mononuclear cells (PBMC), H9 and ACH-2 cells were cultured in complete RPMI-1640, and HeLa-tat cells was cultured in complete DMEM medium supplemented with 10% serum and antibiotics. Porcine and human sera (PS and HS) (Biomeda), fetal calf serum (FCS; Invitrogen) oxamic acid and oxamide (Sigma) were used. Glycineamide (G-NH2) and α-hydroxy glycineamide (α-HGA; manufactured to order by Pharmatory Oy, Oulu, Finland) were kindly provided by Tripep AB, Stockholm, Sweden. 13C2/15N-labeled Fmoc-glycine (Isotech) was transformed to 13C2/15N-labeled G-NH2 by Fmoc peptide synthesis. 13C2/15N-labeled G-NH2 was dialyzed against PS or FCS to produce 13C2/15N-labeled metabolite of G-NH2 which will be referred to as Met-X (Fig. 2A, B and 2C). HIV-1 stock of SF-2 from H9 cells was prepared as described previously , and 50% tissue culture infectious dose (TCID50) was determined. H9 cells were infected with SF-2 at 100 TCID50 by incubating for 2 hours at 37°C. The cells were then pelleted, washed and resuspended in complete RPMI medium containing HS or PS, and the test compound was added. Cells were cultured for 11 days, and the growth medium was changed seven days post-infection. The HIV-1 p24 antigen contents were assayed at day 7 and 11 post infection essentially as described elsewhere  (see below). For RT-assay, the manufacturer's procedure was followed (Cavidi Tech AB, Uppsala, Sweden). 13C2/15N-labeled or unlabeled G-NH2 was enzymatically transformed to Met-X by dialysis against FCS or PS at 37°C. Dialysis was performed with 10 ml of serum in a dialysis tubing (5 kD MWCO) that was prewashed by dialyzing 5× against PBS under constant stirring. After 24 hours, the dialysis solution (DS) containing Met-X was analyzed by injecting it onto a 250 × 10 mm, 5 μm cationic ion-exchange column, Theoquest Hypersil SCX, (Thermo), with 90% 0.1 M KH2PO4pH 4.5/10% acetonitrile as mobile phase at isocratic flow. The absorbance was measured at 206 nm. Lyophilized 13C2/15N-labeled Met-X was also analyzed as above except that a mobile phase of 90% 2.5 mM formic acid pH 3/10% acetonitrile was used. All HPLC chromatograms were compared using retention time as an indicator. Once the structure of Met-X was indicated by NMR (see below) to be α-HGA, the HPLC properties of Met-X and chemically synthesized α-HGA were analyzed under the same conditions. The HPLC peak fraction containing 13C2/15N-labeled Met-X was isolated, lyophilized, and analyzed with NMR. Due to the low natural abundance of 13C- and 15N-nuclei, a commercially available labeled glycine with two 99% 13C- and one 99% 15N-isotopes (Fig. 4A) was used as starting material. The labeled glycine was transformed into G-NH2 (Fig. 4B) which was dialyzed against PS or FCS to obtain labeled Met-X. The 13C/15N-labeled Met-X was purified by HPLC and concentrated by lyophilization before being analyzed with NMR. The samples were analyzed on a Bruker DPX 300 MHz, a Jeol Eclipse+500 MHz and Bruker DMX 600 MHz spectrometers. Capillary electrophoresis experiments were carried out at 20°C with a BioFocus 3000 system (Bio-Rad) which was equipped with a fast scanning UV-Vis detector. Fused silica tubing (50 and 365 μm inner and outer diameter, respectively) was purchased from MicroQuartz and cut to a length of 23 cm (with 18.5 cm effective length). Sodium phosphate buffer (0.05 M) at pH 7.4 was used as a background electrolyte. The polarity was set from positive to negative (with the detection point closer to the cathode). The capillary was flushed with the buffer for 1 minute before each run. The Met-X solution obtained from the dialysis procedure was diluted two fold in the buffer solution and filtered through a syringe disc filter (Ultra free-MC 5 000 NMWL, Millipore) prior to injection by pressure (3 psi·s). α-HGA was dissolved in the buffer at 10 mM concentration and injected by pressure (3 psi·s). The applied voltage was 10 kV in all experiments resulting in 50 μA current. p24-ELISA of infected cell culture supernatants was performed essentially as described elsewhere . Briefly, rabbit anti-p24 coated micro-well plates (MWP) were blocked with 3% BSA in PBS at 37°C for 30 minutes. Supernatants from infected cells were added to the plates, followed by incubated at 37°C for 1 hour. The MWPs were washed three times, and biotinylated anti-p24 antibody (1:1 500) was added. One hour after incubation, the MWPs were washed and incubated with HRP-conjugated streptavidine (1:2 000) for 30 minutes. Finally, the MWPs were washed and detected by adding the substrate o-Phenylenediamine Dihydrochloride (Sigma). Recombinant p24 at fixed concentrations was used as a standard. The plates were read in a Labsystems multiscan MS spectrometer. For RT-ELISA, the manufacturer's procedure was followed (Cavidi Tech). The antiviral activity of α-HGA and some other structurally related compounds was tested in infected H9 cells in the presence of FCS at drug concentrations of 100 μM. H9 cells were infected as described above and cultured in medium containing oxamic acid, oxamide, α-methoxy glycineamide and Boc-α-methoxy glycineamide. The sera from different animal species were diluted 10-fold in 50 mM potassium phosphate buffer pH 8.0. To 100 μl (10% serum) were added 0.1 μCi [14C]G-NH2 (radiospecificity: 56 mCi/mmol), and the samples were incubated for 1, 6 or 24 hours at 37°C. At these time points, 200 μl cold methanol was added, and the samples were left on ice for another 15 minutes. After centrifugation at 15,000 rpm, the supernatants were subjected to HPLC analysis using a SCX-partisphere column (Whatman). The following gradient was used to separate G-NH2 and Met-X (α-HGA): 5 mM buffer B (5 mM NH4H2PO4 pH 3.5) (10 minutes); linear gradient to 83% buffer C (0.3 M NH4H2PO4 pH 3.5) (6 minutes); equilibration 83% buffer C (2 minutes); linear gradient to 100% buffer B (6 minutes); equilibration 100% buffer B (6 minutes). 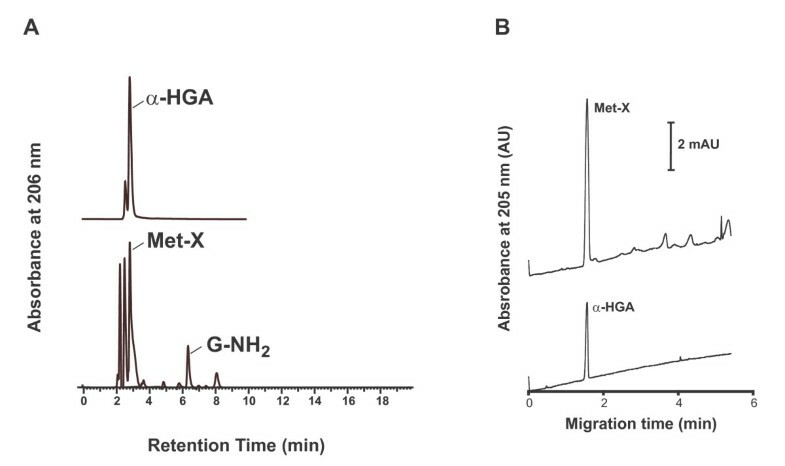 The retention times of G-NH2 and α-HGA were 12 and 2 minutes, respectively. H9 cells were infected with HIV-1 SF-2 at 100 TCID50 by incubating for 2 hours at 37°C. After seven days of incubation, medium containing Met-X or α-HGA was added. Cells were cultured for an additional four days, and progeny virus was analyzed by transmission electron microscopy (TEM). The HIV-1-infected H9 cells were fixed freshly upon embedding in epon, essentially as described before . Sections were made approximately 60 nm thick to allow accommodation of the volume of the core structure parallel to the section plane. Duplicate samples were used and minimal beam dose technique was employed throughout. Evaluation of morphology was done with series of electron micrographs to depict different categories of virus morphology. Similar results were also obtained with chronically infected ACH-2 cells induced to replicate HIV-1. We thank Pia Österwall and Sung Oun Stenberg for help with the dialysis and antiviral assay. We thank the original donors of the following reagents that were obtained through the AIDS Research and Reference Reagent Program, Division of AIDS, NIAID, NIH: the CD4+ cell lines H9  and ACH-2 , and the CD4- cell line HeLa-tat-III . This work was supported by grants from the K.U. Leuven (GOA-05/19), Swedish Research Council (grant no. K2000-06X-09501-10B), Swedish International development Cooperation Agency, SIDA (grant no. HIV-2006-050) and Tripep AB. Author AV is a shareholder and a director of the board of Tripep AB, and author ML is an employee of Tripep AB. SH performed electron microscopy, ÁV capillary electrophoresis, and ML HPLC analysis. MH together with WT and IR performed NMR analysis. JB performed the experiments with different animal sera. SA performed all other experiments in the study and wrote the manuscript with AV. AV is the principal investigator and conceived of the study. All authors read and approved the manuscript.